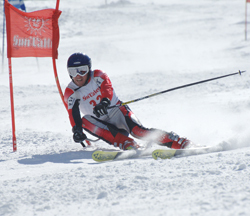 Ski racer Wes Powell, from the winning Montana State University squad, lays down a blistering final run in the championships of the fourth annual Holding Cup on the Warm Springs side of Bald Mountain last weekend. Powell’s teammates included Matt Murphy, Kat Latham and Brett Jacobson. The competition boasted a strong field of 12 four-person teams, each of whose members went to the same college or university. The benefit event, named after Sun Valley Resort owner Earl Holding, gets bigger and more popular each year. The siege went on for years. They threw everything they had at us. The White House became a bunker. What about candidates’ mental health?